Fans of Tales of the Crypt can decorate their jackets with this extra-large enamel pin of the official Tales from the Crypt logo! Dual pin-back metal badge. This extra large Tales from the Crypt enamel pin features a black, white, and red version of the logo. Measures 2 inches wide x 1 inch tall. Brand-new on card backing in factory sealed bag. 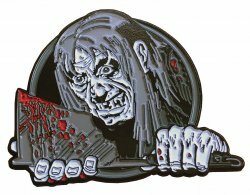 We also offer the Tales from the Crypt Keeper with axe enamel pin while supplies last! Use the convenient Buy Both button below, if you dare!